Click here to sign up for our email newsletter! Exclusive behind the scenes, coupons & more. 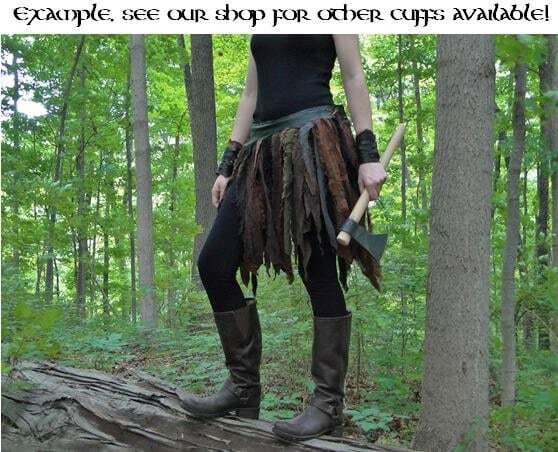 Add amazing quality, detail and a finished look to your costume! 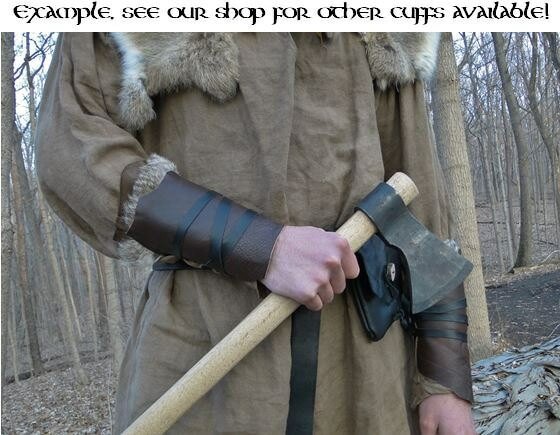 Great for any Viking, Warrior, Barbarian, or Archer...Handmade with high quality soft genuine leather. 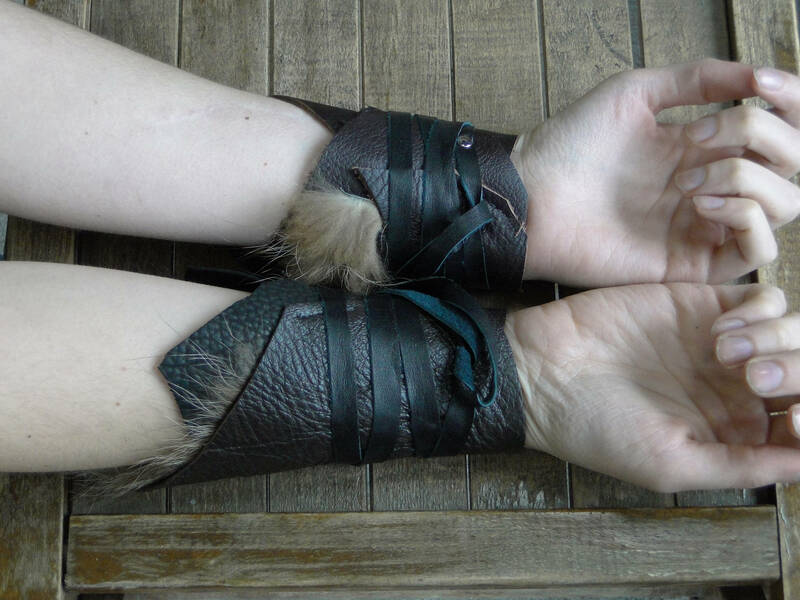 They wrap around and secure with a long attached leather tie; making them adjustable to any wrist size, comfortable to wear, and easy to put on. 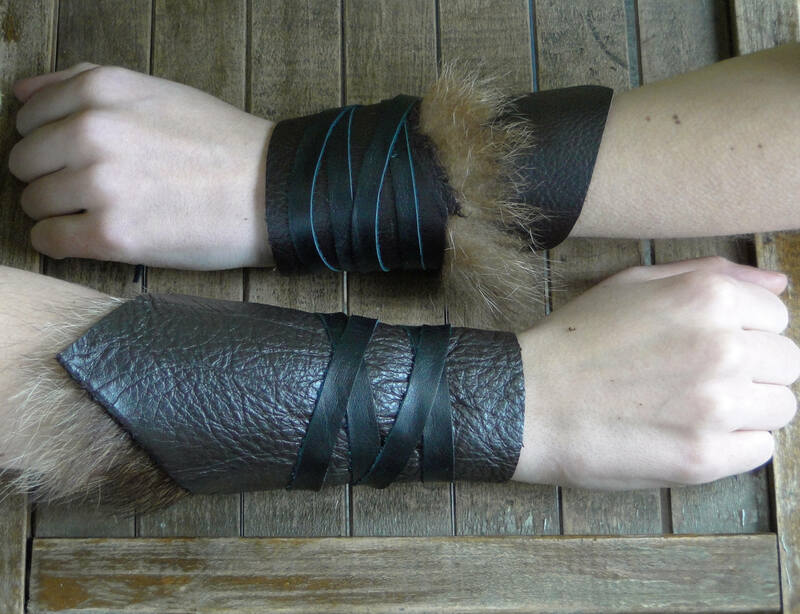 Can be worn by men or women, interchangeable for left or right hands. Each pair is thoughtfully put together to create a unique & one-of-a-kind look. We have a large variety of styles & colors; visit our shop to see more! Please remember we are not responsible for any customs/import duties/international taxes that your country may charge you upon delivery. Please note we do charge %7 Indiana State Sales Tax. >> Items marked 'Ready to Ship' are usually shipped within 3 business days. Items marked 'Made to Order' need the specified time allowed to be made (see items description). You will receive an email confirmation with tracking number the day your item is shipped. We usually ship Tuesday & Friday. >> If you need an order rushed - please ask! We are happy to help if we can. For extra, we can overnight an item if it's in stock. >> Returns - We accept returns. Please contact us within 7 days of receiving. We can only refund the price of the item, shipping costs are non-refundable, and you are responsible to pay the return shipping. Items must be returned in new condition. - Items with custom engravings or initials are not returnable. Neither are custom sized garments, or custom colors. >> Exchanges - You can exchange an item for another size or color, just contact us. Must be in new condition, all shipping costs are your responsibility. >> Cancellations - You can cancel your order within 24 of purchase, if we haven't shipped or started work on it yet. All designs, images and content copyright © FolkOfTheWood 2018. all rights reserved. Some of our items are machine washable, others are not. Please read item descriptions or ask us if you are unsure. Leather/fur should never be put in a washing machine. Linen & faux suede fabrics should never be put in a dryer, should hang to air dry only. When using a washing machine for linen or cotton clothing, use a gentle, cold cycle. We love creating custom pieces, contact us with your ideas! Yes we ship all over the world! But please remember we are not responsible for any additional customs/VAT/import taxes that your country may charge you upon delivery.